Although the new rules of our economy, my experience in the "real life" as a private tour guide is that US$ currency still being hard to obtain in Argentina and Buenos Aires and it is highly appreciated, mostly the notes of 50's and 100's and they must be in good conditions due to many times are used to save money. Drawned or stained notes could be difficult to use. For tips, the 5 ones are always welcomed (of course!). I strongly suggest you to visit us with USD currency in cash. You can be lucky with your 20's but the worst are the notes of 10's. Your main budget should come in big notes of usd 50 and 100. If you are going to exchange, you will always do a better deal in Buenos Aires than in the countryside. In Argentina, Buenos Aires included, for exchange money, as in banks as in exchange houses, they will ask you the passport, the original one and a focotocopy. As your private tour guide in Buenos Aires, I strongly recommend you to do your banking operation close to the hotel in order to return back and leave there the passport, in the hotels is currently allowed to exchange money and this is another comfortable manner of operate. The schedule of the exchange offices is from 10 am till 6 pm, always from Monday to Friday. Usually houses open on weekend do not pay the better rate. 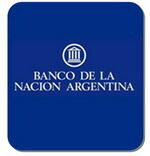 At the Airport, you can exchange at a fair rate at BANCO de la NACION, there are in each terminal. There are two banks, both have blue brands, so my Friends, again, I'm suggesting to go to the official Bank, the BANCO DE LA NACION, not to the other one. You can see here the logo of one I'm suggesting. There are also Atm's for use, but assume they could be lack of currency and they charge a fee of around usd 4 per extraction. On Weekends there are a couple of places where you can exchange, but they will not bring you always the best rate, but they are whole the weekend open. Get in mind you also can exchange in an ATM, they will charge you around US$ 4 whatever amount you take and it is so much faster than the line at the exchange office. To use an ATM in San Telmo on Sunday is just impossible, take that in mind, many purchases in that area will be in cash. Something that you will never be able to do is to get US$ currency from an ATM, it doesn't matter if your bank account is originally in US$, it will authomatically driven into pesos. So, I'm meaning you will never get dollars in Argentina. Bring cash in USD with you. - You can exchange in many places like banks, exchange houses, Atm's (no dollars from them only pesos) and hotels. - The easiest manner is hotels due to no documents required. - The Atm's charges around usd 4 extraction and you may be required to do many extractions.